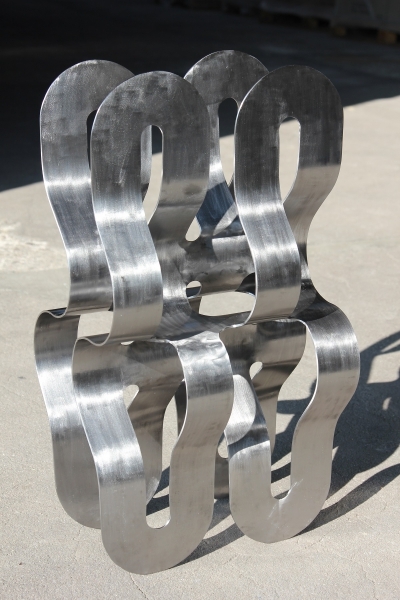 Christoph Ohler’s sculpture “MBC” was created fom a flat sheet of steel. Curved sections were cut away. Then the form was bent and soldered resulting in eight connected Moebius strips. One of the cool things about the Moebius strips is how much their appearance changes depending on the viewers vantage point. “MBC” enhances the property of multidimensional visual perspective. “Towards Infinite Smallness in layered Space” by Irene Rousseau is a 3-D paper construction. This work illustrates the negative curvature on a hyperbolic plane. The repetitive forms become increasingly small as they reach out to the boundary of the round disc. The paper shapes are not applied to create a flat surface, but instead the elements are of differing thicknesses, giving the work a complex surface. 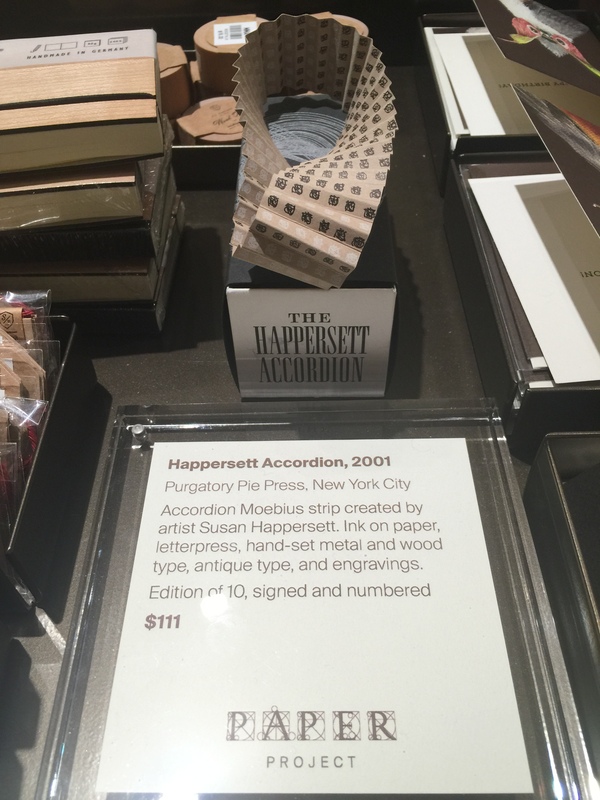 In between observations on math art in Manhattan galleries and beyond, a quick shout-out for my own art work. 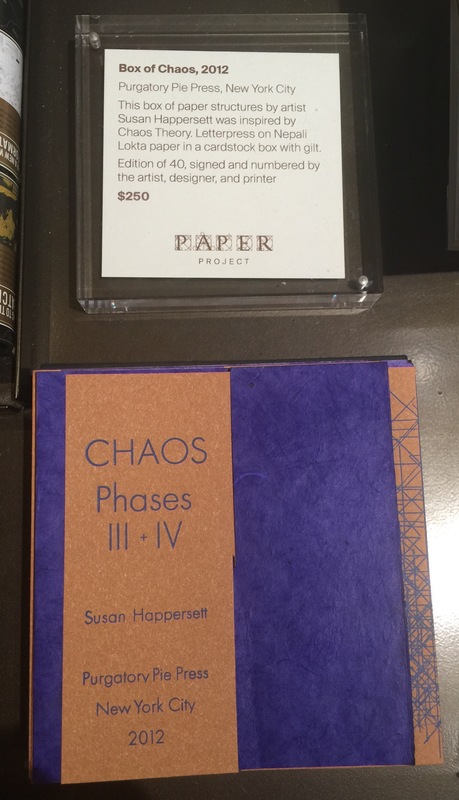 Two of my collaborations with Purgatory Pie Press are now for sale at the new “Paper Project” gallery at the Metropolitan Museum of Art (back of the lobby on the left side when you come in through the main entrance). Box of Chaos is a series of 4 paper sculptures based on Chaos Theory. 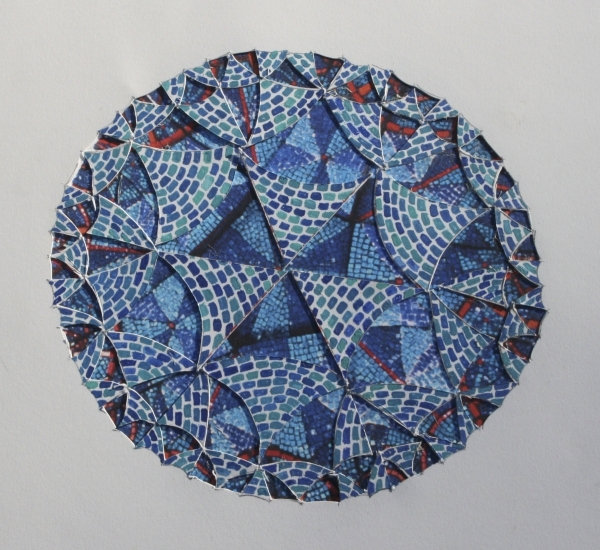 This group show features work form the 1840’s to 2010 that builds a links between science and Mathematics and the artistic spirit. In one of the first galleries there is a copy of Edwin Abbot’s 1884 book “Flatland: A Romance of Many Dimensions”. In this novel Abbott creates a two dimensional society and introduces a three dimensional character with interesting results and exciting prospects about further dimensional expansion. Abbott’s art allows his readers to imagine the possibility of a fourth dimension, a Mathematical idea that was very new at the time. Installed in the largest room of the gallery is Tim Hawkinson’s large rotating sculpture “Gimbled Klein Basket” a wonderful homage to the “Klein Bottle”. A Klein Bottle is an impossible form first introduced by mathematician Felix Klein in 1882. Like a Moebius strip it has only one side, but a Klein Bottle has no boundaries, whereas a moebius strip has boundaries at its edges. Compare to, for instance, a sphere, which has no boundaries either. The basket structure of Hawkinson’s “Gimbled Klein Basket” creates an interesting grid pattern on the shape, adding another visual element to the form. The hand crafted quality of the object makes it seem as if this shape is actually possible in 3-D. By rotating the sculpture the viewer has a chance to examine the form from all angles. 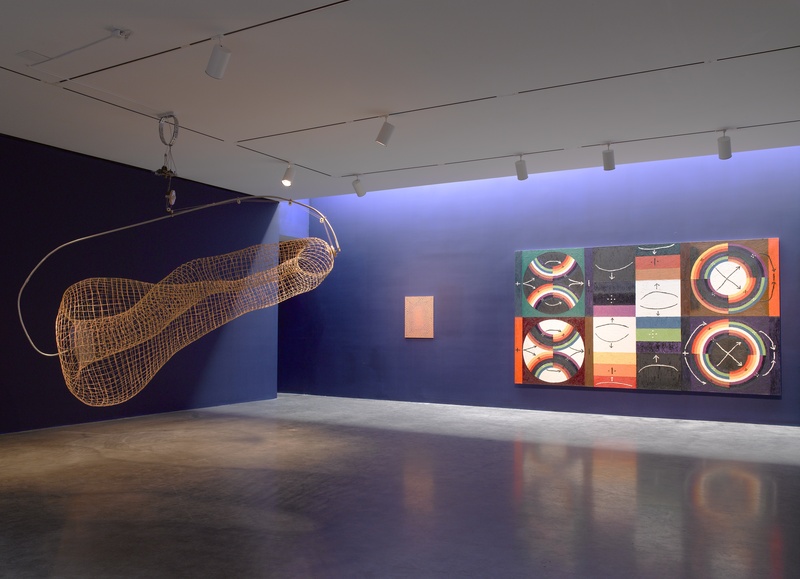 Installation view of the exhibition, Eureka, Pace Gallery, 508 West 25th Street, New York, May 2–June 27, 2015. From left: Hawkinson, Gimbled Klein Basket, 2007; Siena, Battery, 1997; Jenson, Physical Optics, 1975. Photograph by Tom Barratt, courtesy Pace Gallery. 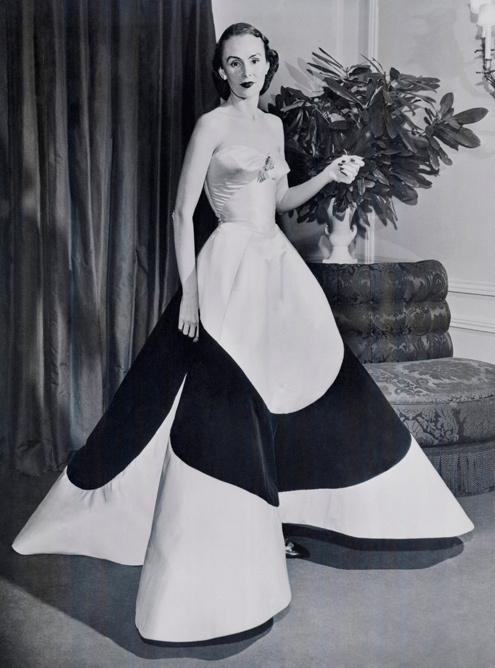 When you think about evening gowns, mathematics may not be the first think that comes to mind, but Charles James used geometry and engineering to design his stunning sculptural creations. In 1944, Vogue Magazine referred to his “Mathematical tailoring”. The Metropolitan Museum has devised an exhibition that celebrates the mathematical structures of James’ work using technology to enhance the viewer experience. Robotic arms with cameras and video recorders present close-up details of structural elements of the gowns. X-rays provide an inside glimpse at the architectural support systems. Computer models provide 360 degree topological maps of the twists, spirals, and folds incorporated into the fashion. Unfortunately it was very dark in the gallery and impossible to take photos but the Metropolitan Museum has a great website with videos and images at metmuseum.org. I have included two of my favorite dresses. The evening dress “Four Leaf Clover” features a hyperbolic curve for a sweeping skirt. The green satin Spiral dress incorporates a spiral of fabric that seems to flow directly back into itself creating an Moebius strip that encircles the wearer. There are many other examples in the exhibition of the complex geometry utilized to design these creations. Throughout his career James was also involved with teaching other designers to use his mathematical techniques. He invented his own schematic dress forms and mannequins that are also on display at the museum. 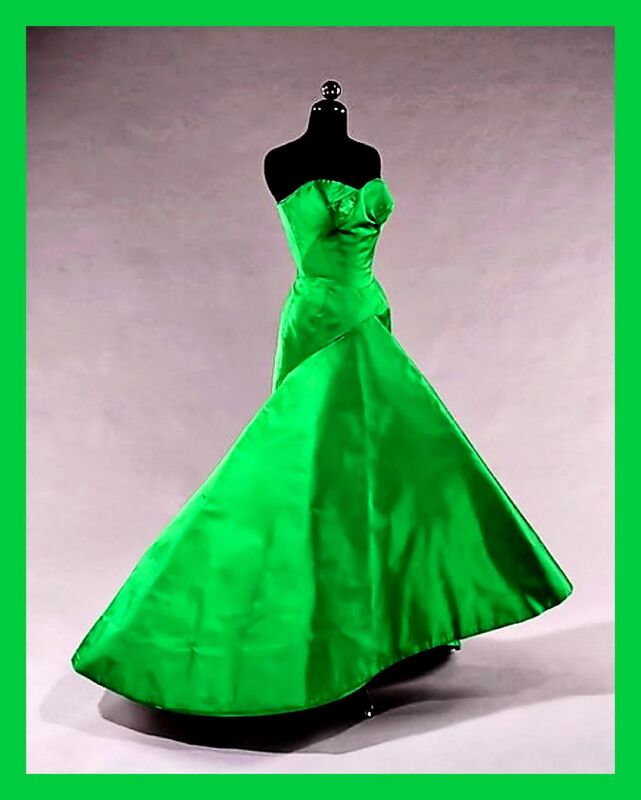 The engineering nature of Charles James’ approach to fashion combined with the technologically curated presentation of the Metropolitan Museum creates an exhibition that reveals connections between Mathematics and fashion design.